It is well known by now that Elon Musk's plan for Tesla involves fully autonomous vehicles that don't require drivers, not to be confused with the semi-autonomous Autopilot which is purposed to assist drivers. During Code Conference, Musk did mention Apple as a future competitor to Tesla, as the latter is investing heavily in its Titan project destined to deploy self driving cars on the road by 2020. Even UBER considered using a Tesla fleet if autonomous driving is fully functional. However Musk is not that excited about ride sharing services at the time being. 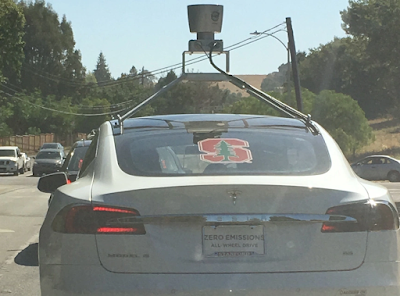 Last week, Tesla Owner Blog reported seeing a self driving Model S heading to Tesla's headquarters in Palo Alto, CA with what appears to be a LIDAR sensor fixed on top of its roof. The vehicle had giant Stanford logo on the rear windshield and a Stanford license plate frame with a paper plate, however the car did enter the car park of the company suggesting that it might be a cover up for testing Tesla's fully autonomous driving system. Clearly, Tesla is trying to convince locals that this is part of a Stanford research project. Although Stanford is a very wealthy university, I doubt they would be using a brand new Model S for experimental purposes. My suspicions were confirmed that this was a Tesla corporate vehicle when I saw it enter the back parking lot of Tesla headquarters! According to a TMC forum member, the car has a Velodyne HDL-64: HDL-64E 3D LIDAR units that generate live contour maps of its surroundings. He went on to suggest that it could also be used as a benchmark of "truth" for other self-driving sensors under consideration. 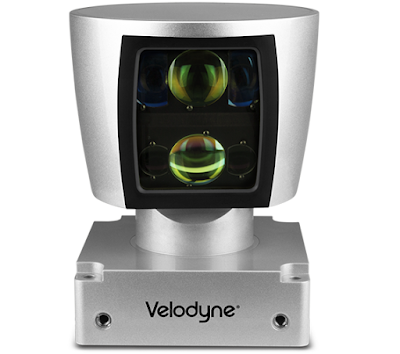 Based in Silicon Valley's Morgan Hill, Velodyne is specialized in audio equipment (Velodyne Acoustics), LiDAR (Velodyne LiDAR), and marine solutions (Velodyne Marine). According to their website, the HDL-64 3D LIDAR sensor uses 64 fixed-mounted lasers to measure the surrounding environment, each mechanically mounted to a specific vertical angle, with the entire unit spinning while dramatically increasing reliability, FOV, and point cloud density. The HDL-64E LiDAR sensor is designed for obstacle detection and navigation of autonomous ground vehicles and marine vessels. Its durability, 360° field of view and very high data rate makes this sensor ideal for the most demanding perception applications as well as 3D mobile data collection and mapping applications. The HDL-64E's innovative laser array enables navigation and mapping systems to observe more of their environment than any other LiDAR sensor. It's really quite interesting to see how extensive the tests are for electric vehicles these days and a bit reassuring too. I'd hate to think about what might happen if the tests aren't done comprehensively enough!